The sustainable and non-toxic furniture in Form Maker’s new ‘Gobble’ line will delight both parents and children, with adorable animal designs. Made entirely from pressed recyclable paper, the collection reimagines cartoony animal heads into bench chairs, pencil holders, catchalls and other accessories. The goal behind Gobble is to start teaching children about the importance of sustainable design at a young age, setting the stage for a future of responsible living. The makers behind Gobble, Kira Pan and Mandy Cai, came together with a love for using recyclable materials. The pair found that most furniture geared toward kids on the market was made from toxin-packed MDF or non-biodegradable plastic. 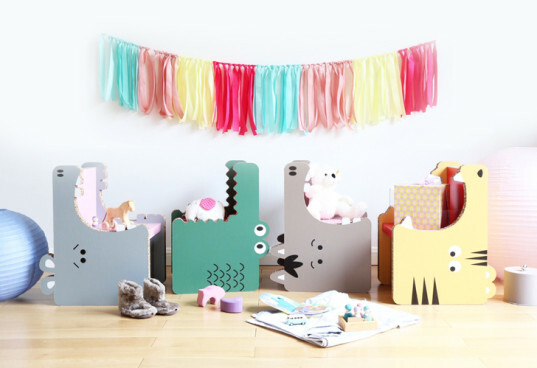 Wanting to create a line of furniture that appealed to children and to adults, Pan and Cai set out to create a whimsical line that was environmentally safe. Aside from being made from safe materials, Pan and Cai wanted to design appealing furniture that would excite and engage children. The bright and cartoony animals became the basis of the line, enticing with fun details. The durable animal head chairs are made from recycled paper fibers, pressed and imprinted with VOC-free inks and adhesives. The material is lightweight, versatile, and also completely recyclable, allowing each piece to be taken to the recycling center at the end of its long life. Gobble has just launched a Kickstarter campaign for their line of eco-fun furnishings, available for pre-order now. The pair hopes their line will encourage a dialogue of sustainable living, letting young minds equate sustainability and fun.